In June 2013, US President Barack Obama directed his administration to establish regulations for greenhouse gas (GHG) emissions from new and existing power plants. But Congress has so far declined to implement a federal cap-and-trade system or a national carbon tax to regulate GHGs on a widespread basis, even though several legislators in both houses of Congress have introduced proposals to institute a price on carbon. To compensate for the lack of national carbon dioxide (CO2) regulation, a dozen states have initiated their own regulations alone or in conjunction with others. In January 2013, California officially launched its comprehensive cap-and-trade program while nine states in the Northeast region of the US continue to participate in the Regional Greenhouse Gas Initiative (RGGI), a carbon trading program aimed at the power sector. The Canadian province of Québec joined forces with California to form a cross-border market in January 2014 while Alberta continues to press forward with its carbon reduction program and British Columbia remains committed to its pioneering carbon tax and Carbon Neutral Government program. Pacific Coast neighbors British Columbia, California, Oregon and Washington have also joined forces to take on the challenge of reducing GHG emissions in the region, with Oregon and Washington possibly adopting a price on carbon pollution as part of this initiative, known as the Pacific Coast Collaborative. But well before the launch of these state-run compliance markets, the Chicago Climate Exchange (CCX) aimed to demonstrate the viability of a multi-sector cap-and-trade program supplemented with project-based offsets. The CCX ceased its emissions reduction program in 2010, but continues to run a voluntary offsetting program for its members. The Canadian province of Alberta became the first jurisdiction in North America to impose a carbon compliance system in July 2007. Alberta requires facilities that emit more than 100,000 tonnes of carbon dioxide equivalent (tCO2e) a year to reduce emissions intensity by 12%. Companies can comply by making improvements to their operations, purchasing Alberta-based offsets, contributing to the Climate Change and Emissions Management Fund at a rate of $15/tCO2e, or purchasing or using Emission Performance Credits. Money paid to the fund by regulated companies is managed and invested by a non-profit entity, which has committed $246.9 million to 100 projects to date. The future of the Alberta program is uncertain since the current regulation is set to expire at the end of June 2015. California’s cap-and-trade program is a key element of the state’s plan to comply with its ambitious pledge to reduce the state’s greenhouse gas (GHG) emissions to 1990 levels by 2020, a goal outlined by the state’s Global Warming Solutions Act of 2006 (AB 32). Unlike the Northeast’s Regional Greenhouse Gas Initiative (RGGI, see details below), the California program seeks to cap GHG emissions from all major industries, representing about 85% of the state’s emissions. As part of the cap-and-trade program, the California Air Resources Board (ARB) holds allowance auctions to allow market participants to acquire allowances directly from the agency, with the first quarterly auction taking place in November 2012. The use of offsets as an alternate compliance mechanism is seen as a critical factor in controlling the costs of achieving the emissions reductions mandated by the legislation. California’s regulation limits the use of offsets to 8% of an entity’s compliance obligation. To date, the ARB has approved six offsets project types: livestock, destruction of ozone depleting substances (ODS) from U.S. projects, U.S. forestry, urban forestry, and –more recently – coal mine methane, in April 2014, and rice cultivation, which was added in June 2015. ARB officials are also expected to mull potential regulations to allow offsets from Reduced Emissions from Deforestation and Degradation (REDD) forest projects from Acre, Brazil and Chiapas, Mexico into California’s cap-and-trade program, although the timing of such deliberations is uncertain. In 2014, nine million offsets were transacted specifically for compliance with California’s cap-and-trade program at an average price of $9 per tonne, according to Ecosystem Marketplace research. Sixty percent of these offsets were from ODS projects while 40% were from forestry projects. California-bound offsets were responsible for 92% of the offsets transacted for compliance purposes in North America in 2014. Oregon and Washington require that new power plants offset a certain portion of their anticipated CO2 emissions, with the option of reducing their emissions or paying a fee to an organization that selects and fund offset projects. In 1997, Oregon enacted the Oregon Standard, the first mandatory regulation of CO2 in the United States. The Oregon Standard requires that new power plants built in the state reduce their CO2 emissions to a level 17% below those of the most efficient combined-cycle plant, either through direct reduction or offsets. Plants may propose specific offset projects or pay mitigation funds to The Climate Trust, a non-profit created by law to implement or procure offsets from projects that avoid, sequester or displace CO2 emissions. In 2001, the first offset contract was inked by The Climate Trust, which now has a portfolio that includes 41 offset projects in eight sectors anticipated to offset 5.1 MtCO2e. The types of projects currently being considered by The Climate Trust include: forestry, biogas, and agriculture. In the U.S. Northeast, nine states (Connecticut, Delaware, Maine, Maryland, Massachusetts, New Hampshire, New York, Rhode Island, and Vermont) have entered RGGI’s second compliance phase. The regional cap-and-trade system originally had 10 members at the start of the program, but New Jersey withdrew at the end of the first compliance period in December 2011. The remaining members implemented a comprehensive overhaul that lowered the emissions cap and strengthened the program, which until early 2013 saw allowances trading at the reserve price. The RGGI states approved a 45% reduction in the 2014 cap, from 165 MtCO2e to 91 MtCO2e, with additional decreases of 2.5% annually from 2015-2020. The revamp provided a boost to the program, with RGGI allowances selling above $5 per short ton in recent quarterly auctions. Despite allowing for the use of offsets, the RGGI program has not prompted the production of offsets due to still relatively low allowance prices and technical challenges. RGGI officials do not anticipate offsets coming into the market until allowance prices rise significantly higher – if that ever happens. The original model rule would have allowed certified emission reductions issued under the United Nations’ Clean Development Mechanism to enter the RGGI program if the 12-month rolling average allowance price reached $10/tCO2e, but international offsets are now banned from the program. The cap on the use of domestic offsets will remain at 3.3% rather than increasing if allowance prices reach certain thresholds, as dictated by the original model rule. The RGGI states added a new forestry protocol to allow projects for improved forest management, avoided conversion, and reforestation based mainly on the ARB’s U.S. forests offset protocol to leverage the work done by the ARB and the Climate Action Reserve and to provide consistency with the ARB program, which is supporting the development of a domestic supply of these offsets. However, Connecticut and New York will continue to allow projects to be developed under the afforestation protocol featured in the original model rule. Forestry projects that have generated offsets in a voluntary offset program would be permitted to transfer to the RGGI program, assuming that they meet all other RGGI requirements and there is no double counting. The RGGI program also allows for offsets from four other project types: landfill methane capture and destruction, sulfur hexafluoride (SF6) reduction in the electricity sector, avoided agricultural methane emissions, and energy-efficient building projects. In April 2013, California Governor Jerry Brown found that the Québec system is similar or identical to the U.S. state’s program in all material aspects, allowing the two cap-and-trade programs to officially link in January 2014. California and Québec form the core of the current Western Climate Initiative (WCI) as they are the only two jurisdictions among WCI members to fully commit to an emissions trading program so far. Québec set a constant cap for its first compliance period (2013-2014) at 23.2 MtCO2e, when the program covers the electricity and certain industrial sectors accounting for about 30% of total GHG emissions in the province, according to the World Bank’s Mapping Carbon Pricing Initiatives report. The cap rises to 65.3 MtCO2e in the second compliance period (2015-2017) when the fuel distribution sector is phased into the program, but the cap decreases by 2.1 MtCO2e in each year. In 2015, the initiative will cover approximately 85% of total GHG emissions in the province. Québec’s total GHG emissions were 82.5 MtCO2e in 2010, the World Bank report noted. As in California, the use of offsets is limited to 8% of a regulated entity’s compliance obligation in Québec. Offsets can be issued from three domestic protocols: covered manure storage facility projects for methane destruction, landfill site projects for methane destruction and ODS projects with material sourced from refrigerators. Six other US states – Arizona, Montana, New Mexico, Oregon, Utah and Washington – were previously WCI members, but formally dropped out of the program in November 2011 due to the economic recession and rising pushback against the cap-and-trade concept in the U.S. All of these states with the exception of Utah are now members of an initiative called North America 2050 (NA2050), which aims to facilitate cost-effective state and provincial policies that reduce GHG emissions and create economic opportunities. NA2050 has its origins in the 3-Regions Collaborative, which began in 2009 and included representatives from RGGI, WCI, and the Midwestern Greenhouse Gas Reduction Accord who were considering potential areas of linkage between the developing carbon trading programs. In 2015, the Canadian province of Ontario announced plans to rejoin the carbon trading component of the WCI program, with the enabling regulations still being developed. The Canadian province of Manitoba, previously a member of the WCI, has yet to indicate whether it will resume plans for a carbon trading program. British Columbia, another provincial WCI member, does not engage in the trading program, but implemented a carbon tax in July 2008, initially set at C$10/tCO2e and increasing each year by C$5/tCO2e through 2012. The tax on carbon emissions is a critical component of British Columbia’s Climate Action Plan to reduce GHG emissions by 33% by 2020, according to the Ministry of Finance. The Pacific Carbon Trust was a now-defunct British Columbia Crown corporation tasked with sourcing offsets to meet the provincial government’s carbon neutrality commitment. The trust developed the Pacific Carbon Standard, which defines the requirements for developing offsets to be recognized as Pacific Carbon Units (PCU). Originally exclusively owned and transacted by Pacific Carbon Trust, PCUs are now transacted by other parties for the voluntary market. Under British Columbia’s standard, the average price of offsets is $25/tCO2e. North America’s supply of and demand for voluntary offsets remained strong in 2014 despite supplier concerns that attention would shift predominantly to the California and Québec cap-and-trade markets that started in 2013. 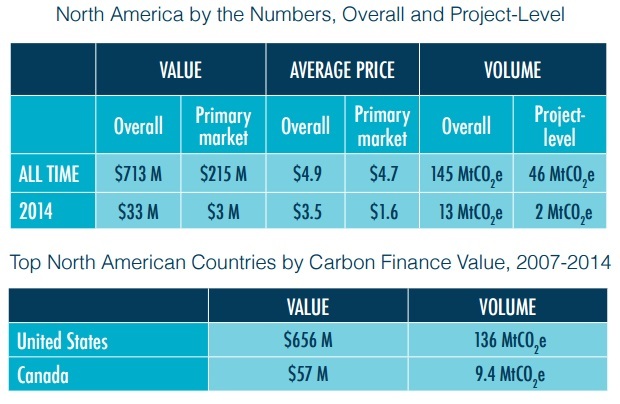 For the first time, Ecosystem Marketplace tracked both compliance and voluntary transactions across all project types within the region and found that the markets traded nearly equal volumes, with 12.5 million tonnes (MtCO2e) by voluntary buyers and 11.5 MtCO2e sold to compliance entities, according to Ecosystem Marketplace’s State of the Voluntary Carbon Markets 2015 report. The value, however, differed drastically: with an average price of $3.5 per tonne in North America, the voluntary markets generated $40.5 million in value – only half of the value attributed to compliance markets. Part of this value gap can be ascribed to the dominant project type: the most common voluntary offsets were wind and landfill methane, which traditionally sell for much less than the improved forest management or ozone-depleting substances project types eligible for the compliance markets. The voluntary market, which laid the foundation for the protocols adapted by California’s Air Resources Board (ARB) for compliance offset project use, continues to innovate new project types and serves as a testing ground for compliance methodologies. Last year, the American Carbon Registry listed the first project under its Voluntary Emissions Reduction in Rice Management Systems, which could serve as a market test-run to the rice management protocol, which was approved by the ARB in June 2015. Other new methodologies currently testing voluntary offset market waters but not yet under consideration for compliance include international REDD+ (reduced emissions from deforestation and forest degradation), transportation efficiency, grasslands, and wetlands. On the compliance side, California continues to draw the most attention and transactions but offsets remain an ongoing part of carbon pricing programs in the Canadian provinces Alberta, British Columbia, and Québec (with Québec linked to California’s market as of January 2014). On a national level, market participants believe the U.S. Environmental Protection Agency’s Clean Power Plan, which mandates that states reduce pollution from power plants, could further legitimize the voluntary market – if states consider market mechanisms.